I spent eight years working as a submariner in the Royal Navy. I loved my job - I was away for four or five months of the year and visited plenty of foreign ports. But after seven years’ service, I decided to leave. My wife was expecting our second child and having missed so much of my first born’s life, I wanted to be there. I left in March 2017 and immediately started working. Most of my colleagues were ex-Royal Navy, so sometimes it felt as though I’d never left. However, after seven or eight months, my family life started to go downhill. I was constantly arguing with my wife. I was never physically violent to her but our explosive arguments often resulted in things being thrown around the house - all in front of our daughter. There were weeks where we wouldn’t talk and when we did, I met every comment and question with anger and confrontation. I stopped seeing my friends. I felt like I was living on a knife’s edge. In December, my wife told me that once we’d got through Christmas, she was calling time on our marriage. Without her knowing, I packed my bags and left home. I turned my phone off and spent a few days at my dad’s house. When I returned home, my wife and I had a chat - no anger or shouting - and she suggested that I might need to get some help. She said it might be the only thing that could save our marriage. After searching Google for ex-forces’ help, I found PTSD Resolution. They put me in touch with a therapist, just a few miles from home, who started my treatment. I often felt angry and stressed during our sessions but I always felt better when I returned home. Even my wife started to notice a difference. As the weeks went by, our sessions turned to informal chats and I was feeling way more relaxed and happy. Over time, my family life improved dramatically, and my wife and daughter seemed happier than ever. One of the symptoms of my PTSD was insomnia, and it was my therapist who suggested that I start doing some physical exercise as a way of de-stressing. That week, I took up running and I’ve been running ever since. In May, I took part in the Greater Manchester half marathon and have signed up to do another in October. I plan on running a full marathon in April 2019. I have done all of the events in aid of PTSD Resolution as a way of saying thank you for my treatment and also to provide funds to help others in the same situation as I was. Although I did not go to a war zone, leaving the military and readjusting to life had a huge effect on my mental health. Being in the Armed Forces provides you with a stable life, housing, good wages but once you leave, having to be self-sufficient and provide for your family can be very stressful. There’s no shame in admitting that and seeking help. I hope my story helps others to realise that coping on Civvy Street is definitely possible, but sometimes a little bit of help is needed, and it’s okay to ask for that. Don’t let it get to the point where you end up almost losing your entire family. 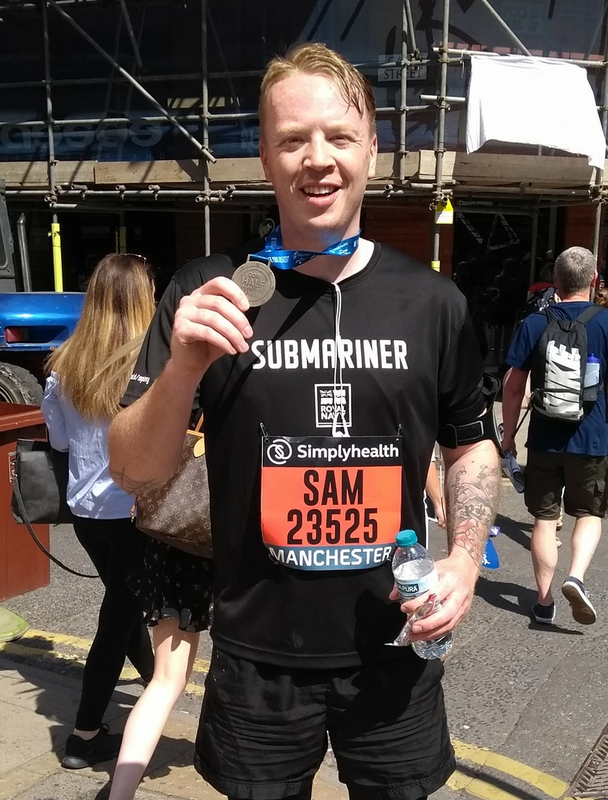 PTSD Resolution is extremely grateful to Sam for sharing his story and for his fantastic fundraising efforts. We wish him the best of luck in his upcoming events. PTSD Resolution relies entirely on public donations to continue our work with veterans. To donate, head to our JustGiving page: www.justgiving.com/ptsdresolution.